Columbus, Georgia: In 2013, we partnered with Clemson University’s Brick Research Center for a three week long thermal-mass study at our field test in Columbus, GA. The data gathered from this research demonstrated clearly that Industry energy models are not effectively accounting for the effectiveness of thermal mass in the southeastern U.S. The UK’s SPAB organization (society for the preservation of ancient buildings) has reported heat transfer through massive walls is potentially three times less than the models are telling us. Which is to say, mass wall constructIon may perform as much as 300% better than what the Industry bench marks convey. Information gleaned in Columbus clearly defined our purpose and path: scaling modern, mass wall building alternatives that compete with disposable building while providing multi-century life-cycle. Decatur, Georgia: A design/build contract was signed for the Brennan House before HFA1 was completed. In the late 90's, entrepreneur Marc Brennan began playing a critical role in the revitalization of Oakhurst Village—a post war, working class neighborhood just outside Atlanta. The Brennan's penchant for walkable destinations and urban reclamation made them perfect candidates for the next step. Several months of research were required to compile a 90 page permit submittal for HFA's experimental model. This was an important time for establishing precedence under the jurisdiction of an urban building municipality following a conservative energy code. During this period, we charted a path for permitting mass-wall-construction in the modern context. Much was achieved working with the Brennan's and building in Decatur's Oakhurst village, but an important milestone stands out: urban precedence for an alternative building solution utilizing mass-wall construction. Carlton Landing, Oklahoma: After being approached by New Urbanist Town Founder Grant Humphreys, we relocated the HFA operation to Carlton Landing, Oklahoma. Freedom to innovate motivated this decision; the ability to get concepts out of idea land, and provide tangible examples for progressive cities to reference while rethinking code policy. HFA3 was our first project at the DPZ masterplanned community. The two-story, Charleston inspired spec sold before completion to Jim and Chelsi Wallingford. Several critical techniques were defined during this build that significantly streamlined production and now help define HFA process. 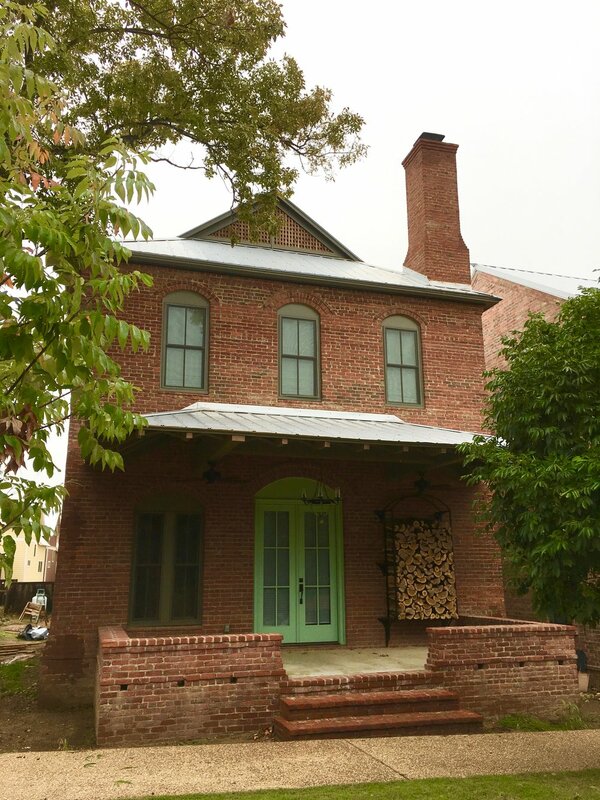 Carlton Landing, Oklahoma: A design/build contract was signed for the Dollins Cottage before HFA2 was completed. We utilized salvaged brick for the first time with this project (from roughly 150 miles away). The techniques innovated during the construction of HFA3 were more systematically realized with HFA4. The Dollins design was a return to steep gabled massing so defining of the HFA aesthetic. The wrapping timber frame porch introduced a simple but wonderfully effective refinement. Without stifling the economy of conditioned spaces, the outdoor space establishes the dwelling's personality while delivering an important and inviting functionality. Carlton Landing, Oklahoma: Salida, Colorado is a small Rocky Mountain town with an impressive masonry tradition. While consulting there for an HFA inspired project, I was pleasantly surprised by the number of long standing, mass-wall buildings. But I was especially inspired by the modest scale of several small, solid masonry structures. Soon after returning to Oklahoma, we sub-developed two large lots into eight small ones, and The Borough pocket neighborhood was off and running. 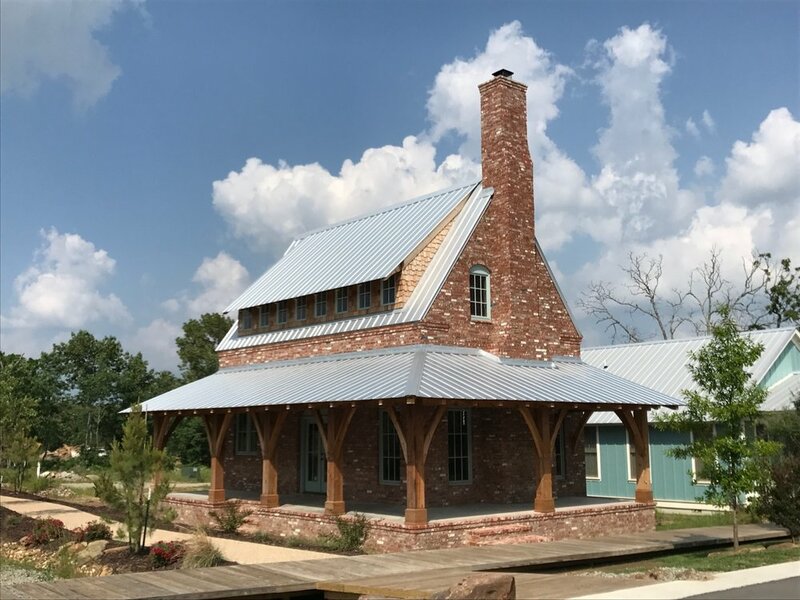 HFA5 was the first cottage to be built, and a contingent of novice students from the Notre Dame School of Architecture raised the masonry super structure for this 700 square foot small house in 14 days. Carlton Landing, Oklahoma: The Tudor plan expands the massing of the Artist Cottage from 700 to 1200+ square feet. There are additional sleeping lofts in both plans not included in the square footage approximations. This is part of a 'smart-volume' approach to design that utilized much of the wasted space involved with the standard 'square footage value metric'— "Small like a yacht not like a shack," as Steve Mouzon likes to say. Three versions of this design visually anchor the overall composition of the pocket neighborhood. With The Borough, we introduced full depth, lugged granite window sills to our building regiment taking our commitment to lifecycle much further. When structural walls fail, the problem more often than not lies with faulty window sill material that allows water to chronically access the depths of the massing. Monastery of the Holy Spirit — Conyers, Georgia: Several years before the inception of Hope for Architecture, I submitted a chapel design to the Monastery of the Holy Spirit just outside Atlanta. Several firms were being considered for the project, and it wasn't until relocating to Oklahoma that we received news that our design had been selected—6 years later. Nevertheless, an opportunity to serve under the auspice of Architecture's greatest patron doesn't happen everyday. The Trappists Monk order holds some 2000 acres of field and forrest, providing one of the most remarkable settings for built expression imaginable.